Contains natural essential oils extracted from plants & flowers. Lasts for up to 80 days. Only approved for use with the Air Wick plug in. 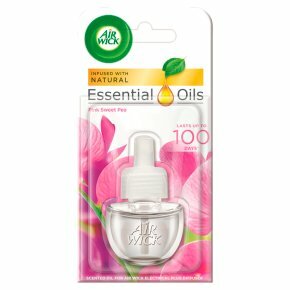 Contains natural essential oils.Lasts for up to 80* days *Based on 12 hours daily usage at minimum setting Pink Sweet Pea - Delight your senses of full bloom pink sweet pea and fresh melon, accented by a burst of sun ripened raspberry. New Air Wick warmer gives you 5X more fragrance control to ensure fragrance is just right for any room large or small so your home always smells fresh and welcoming.